Comparative analysis indicates that brain organization was extensively modified early in primate evolution, subsequent to the divergence of primates from their closest relatives and prior to the radiation of living primate taxa. At minimum, these modifications included changes in the internal organization of existing structures, as exemplified by the altered retinotopy of the superior colliculus; changes in the extrinsic connections of existing structures, such as the advent of terminations within the superficial layers of the superior colliculus arising from prefrontal cortex; the addition of new structural units, including the blobs of area V1, many cortical areas, and the dorsal part of the pulvinar nucleus; and the emergence of new networks of connectivity, including the dorsal and ventral processing pathways, the strong interconnections between higher-order association areas, and the extensive interconnections between association areas and the dorsal pulvinar. This analysis suggests that the evolutionary transformations were especially concentrated in the visual system. It should be said, however, that the prominence of the visual system in this analysis probably reflects to some extent the concentration of effort by neuroscientists on the visual system relative to other brain systems. There is every reason to suppose that other regions—olfactory and auditory structures, for example, or the amygdala, hypothalamus, and hippocampus—were modified during the emergence of primates. At present, however, we lack the comparative studies necessary to identify these changes. Similarly, the studies reviewed here emphasize particular levels or dimensions of brain organization, mainly the nuclei and areas of the thalamus and cortex, and the connections between these structures. There are many other dimensions of neurobiological organization that could have undergone important changes during primate origins—such as, for example, the distribution of neurotransmitters and receptor molecules, and the biochemical and morphological phenotypes of neurons. We know that mammals vary along these dimensions of organization (Preuss, 2001), but, once again, we lack the comparative studies required to specify the changes that took place during primate origins. The great extent of the evolutionary changes that occurred at early stages of primate history challenges conventional ideas about brain evolution held by both neuroscientists and primatologists. Although the neuroscientific literature provides many examples of phyletic variation in brain organization, these variations are rarely treated in a systematic fashion. This has made it possible for neuroscientists to persist in believing that brain organization is highly conserved across mammalian taxa, and therefore that results obtained studying rats, or other convenient laboratory taxa, can be extended with confidence to other mammals. This uniformitarian stance is clearly belied by the evidence. Primate biologists, accepting the uniformitarian premise promulgated by neuroscientists, have focused on the one dimension of brain organization that obviously does vary greatly across taxa—size. Nevertheless, it is clear that evolution can affect brain organization in many ways, and the relationship between changes in internal organization and brain size is by no means very direct. Tree shrews and strepsirhine primates are encephalized to similar degrees (Stephan et al., 1988), but the ways their brains are compartmentalized are very different, as are the patterns of connections between brain structures. In all these respects, strepsirhines resemble tree shrews much less than they do anthropoid primates—animals that are twice as encephalized on average as strepsirhines. Clearly, if one wants to understand how evolution modified the brain structures and systems that subserve cognition and behavior, it is necessary to employ the kinds of neuroscientific techniques that allow one to examine these structures and systems directly, and to employ these techniques within a comparative framework. If the adoption of comparative neuroscientific approaches is crucial for advancing our understanding of brain evolution, it is no less important for advancing our understanding of behavioral evolution. Ideas about behavioral organization derived from neuroscientific studies can lead to insights about behavioral evolution, insights that would be very difficult to obtain by studying behavior alone. Consider the results of the present survey. Probably no one will be surprised to learn that brain structures related to vision were modified in stem primates, including systems specifically related to looking and visually guided reaching. This is just what we would expect, based on the results of comparative morphological and behavioral studies carried out by primate origins researchers. The neuroscientific findings indicating modifications of the superior colliculus and dorsal visual pathway seem congenial to the visual predation model, in particular. Primate visual system modifications are not limited to the dorsal pathway, however: primates also have a ventral tier of cortical visual areas, specialized for object discrimination and recognition. This, too, is perhaps not entirely unexpected, since some interpretations of primate origins emphasize the exploitation of fruit and other plant parts, and thus it makes sense that primates evolved specializations of the brain regions that are engaged when animals choose objects based on their visual appearance. We might even regard the evolutionary parcellation of primate visual cortex into distinct dorsal and ventral processing systems as an elegant solution to the problem of how to accommodate the demands of both visually guided predation and plant foraging. This sort of post hoc analysis ignores some issues of real importance for students of behavior, however. Consider that visually guided looking and reaching is an activity pattern exhibited by many groups of mammals, not just primates, yet primates evolved many nervous system specializations related to looking and reaching. Furthermore, these modifications extend to high functional levels of the cerebral cortex—including posterior parietal, premotor, and dorsolateral prefrontal cortex—rather than simply being limited to the sensory and motor systems that control eye and hand movements. At the level of behavior, looking-reaching activity may be homologous across taxa, but at the level of neural mechanisms, the looking and reaching of primates is in several respects quite different from that of other animals. Similar considerations apply to the specialized neural mechanisms of the primate ventral/temporal pathway and their relationship to visual object discrimination—presumably many mammals use vision to scrutinize potential food items, yet only primates evolved a ventral visual pathway. David Hume, in his Treatise on Human Nature (Hume, 1739-1740/1911), argued that if another species exhibits behavior like our own, we can confidently conclude that the internal mechanisms responsible for that behavior in us are present in the other species as well. This "argument by analogy"—shared behaviors imply shared neuropsychological mechanisms—has been a bedrock of comparative psychology (Povinelli et al., 2000). Yet the validity of this rule has been called into question by recent results in comparative cognition (Povinelli et al., 2000). The neurobiological evidence adds to the case against Hume, demonstrating that the mechanisms underlying a particular behavior or set of behaviors can undergo considerable divergence without producing obvious differences in overt behavior. The key word here, however, is obvious. If two taxa possess different behavioral mechanisms, we should strongly suspect they have different behavioral capabilities. Their behavior may be similar in some ways—and perhaps in ways that are especially conspicuous to human observers—but we can reasonably expect to find differences if we probe their behavior deeply enough. How could the neuropsychology of such a simple activity as looking and reaching vary significantly across taxa? Perhaps the act of looking and reaching is really not so simple. Students of motor control in macaques and humans have decomposed looking and reaching into many component processes (see, e.g., Jeannerod, 1988, 1997; Jeannerod et al., 1995). These include: (1) locating the target in space, (2) discriminating target size and orientation; (3) directing attention to the target location; (4) foveating the target by moving the head and eyes; (5) programming and implementing the initial, ballistic movement of the forelimb toward the target; (6) adjusting the trajectory of the limb as it nears the target, using visual feedback; (7) pre-shaping the hand to an aperture and orientation appropriate for the target to be grasped; and (8) adjusting grip forces to accommodate the actual weight, texture, and compressibility of the target, using tactile and proprioceptive feedback. When looking and reaching are parsed in this way, one can begin to understand how species might vary, with evolution modifying the component processes that contribute to the action. So, the hand preshaping process might be absent, or function quite differently, in animals that make a whole-hand grasp, such as strepsirhines. There could also be differences in the way components of the looking-reaching system interact with the rest of the cognitive system: expectations about where targets are likely to appear, stored in working memory, could direct attention, eye movements, and reaching prior to the appearance of a target, but only if working memory has access to the relevant attentional and motor mechanisms. Movements could then be made in anticipation of the appearance of the target, or movements could be "primed," so as to be produced more rapidly when the target appears. 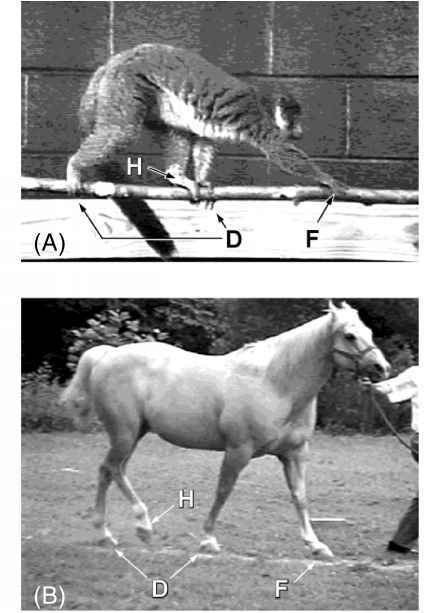 In other animals, looking and reaching might be more controlled mainly by the immediate sensory characteristics of the external stimuli and less influenced by internal states. A difference of this sort could very well distinguish primates from nonprimates, because in primates, the superior colliculus receives strong inputs from parietal and frontal areas implicated in spatial attention and working memory. If the foregoing discussion seems unduly hypothetical, one must bear in mind that there is no significant body of experimental research that compares looking and reaching in different mammalian taxa. Evidently, looking and reaching have not seemed very interesting to comparative psychologists. Moreover, as long as a particular behavior is regarded as a unitary thing, it is difficult to imagine how evolution can work on it, except to change its efficiency or magnitude—one taxon might reach more accurately or more quickly than another, but that is about it. The same principle applies to monolithic psychological categories such as "learning" and "intelligence." Once we understand the component processes that generate a particular behavior, or that comprise a particular psychological process, the scope of evolutionary changes one can conceive of (and thus explore empirically) is greatly enlarged. Neuroscientific studies are critical for uncovering these component processes. It is not necessary that all behavioral studies should include direct investigations of brain function, but our thinking about behavior organization and evolution does need to be neuroscientifically informed. If neuroscientific analysis can reveal unexpected differences in the mechanisms underlying similar behaviors, it can also reveal unexpected commonalities between seemingly disparate cognitive and behavioral functions. Functional imaging studies of semantic representation in the human brain indicate that objects are represented in distributed systems that include not only low-order visual areas, but also certain portions of posterior parietal and ventral premotor cortex (Chao and Martin, 2000; Martin and Chao, 2001). So, for example, ventral premotor cortex is differentially activated when subjects merely view tools as opposed to other kinds of objects, and both ventral premotor cortex and posterior parietal cortex are more strongly activated when subjects name tools than when they name other objects (Chao and Martin, 2000). This is a striking result because the activated zones in ventral premotor and posterior parietal areas either correspond to, or are located very close to, the territories involved in grasping and manipulation. Based on these findings, and on clinical observations of persons with lesions involving the relevant areas, it has been argued that semantic representations of objects comprise both their visual characteristics and the motor schemas appropriate for grasping and utilizing them (Chao and Martin, 2000; Martin and Chao, 2001). As Martin (1998) notes, results like these are consistent with the idea that human knowledge is "embodied," that is, that conceptual systems are directly grounded in structures related to perception and action (Clark, 1999). Remarkably, the frontal and parietal areas involved in grasping in humans are also either identical to, or located very close to, areas that are involved in language (Kimura, 1993; Preuss, 1995b; Rizzolatti and Arbib, 1998), the ventral premotor area corresponding to part of Broca's area and the posterior parietal area to the language cortex of the supramarginal gyrus (Brodmann's area 40). It appears that in the evolution of language, the network of cortical areas that represents objects and object-related prehension were recruited in the service of language. (Whether precisely the same tissue territories are used in language and grasping, or whether there is some functional segregation of these territories, is not clear on current evidence, but the latter result would not necessarily compromise the claim.) This evolutionary analysis, by pointing out a link between forelimb-related and language-related cortical systems, also suggests why it is that language can be conveyed as fully and naturally by manual signing as with speech (Preuss, 1995b). Nobel laureate in neuroscience is reputed to have stated, and evidently without irony, "I'm not interested in evolution—I just want to understand the monkey.") Many neuroscientists seem to regard evolution as an abstract academic concern, irrelevant to the serious business of understanding how the brain works and how it breaks down in disease. Yet our brains did not arise de novo to suit the particular needs of human beings—evolution produced our brains by modifying those of our ancestors. The intimate relationship between language, object representation, and grasping is a particularly dramatic illustration of how evolution co-opts and modifies existing structures to serve new functions. Any attempt to understand the organization of the human brain that does not take account of its evolutionary origins and history is likely destined for extinction.